On behalf of President Trump thank you for allowing me to say a few words. 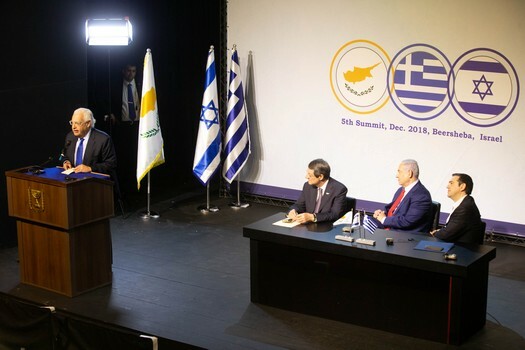 USA supports the trilateral partnership between Israel, Greece and Cyprus. This partnership is an anchor of stability in the eastern Mediterranean and is based on common interests and common values that the three countries share together with the USA. Over the past several years the trilateral partnership has advanced in important projects in a variety of fields, energy, environmental protection, innovation and so much more. One of the projects the East Mediterranean pipeline seeks is to build a gas pipeline to Europe from the Mediterranean sea. Italy along with other members of the EU are partners on the projects designed. This project is of great importance for the stability and prosperity of the Middle East and Europe. The USA wholly supports the project and its goals that help diversify energy sources throughout the entire region and to help bring energy security to Europe. I call on all countries in this region to help ensure that the project is successful. I congratulate the people of Israel, Greece and Cyprus.